Home » Far East is closer, now. Far East is closer, now. A Flat-rack container and a 40ft Open Top container have been enough to ship a whole Panizzolo Plant to Asia. 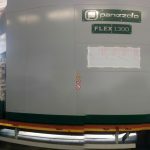 Composed by a Panizzolo Flex 1300 Mobile drum hammermill – 315kw, with magnetic drum separator, and by an Eddy Current separator for non-ferrous metals, this plant will be working with MSW Cans, in one of the biggest and most populated cities of the world. Capable of a 16 tons per hour production rate, Panizzolo Flex 1300 Mobile Drum hammermill features easy moving operations and start-up procedures. Panizzolo Technicians also worked hard to translate Panizzolo software wizard in the control panel touch-screen computer. Everything has been translated into asian ideograms. This will allow every user, after a short teaching, to use Panizzolo Equipment without problems. These are, by the way, just a few reasons why the Asian customer chose Panizzolo to treat his waste. Most important reasons are output product quality and the money-saving management of the whole plant. Plant is now in transit, loaded on a containership which will deliver it within 5 weeks, making far East a little closer.